Your DSLR has multiple focus points. Lower end cameras, like the Nikon D40, only has 3. The D700 has 51. But just because you have multiple focus points, should you let your camera decide which one to use? Because your camera — despite possibly being very expensive — cannot read your mind. (Wouldn't it be nice if it did?) You may have wanted to focus on the person standing behind the tree, but your camera decided to focus on the tree because it was closer to you. So let's go over the settings first and what each does, and how to adjust them to suit the purpose of the picture you're taking. Note: we'll be using Nikon as an example because, well, that's the camera we have! On higher end cameras, these settings can be set with AF-switch next to the lens. On lower end models, you can change the settings in the Custom Menu options. In this mode, the camera tries to focus on a single, non-moving point when you press the shutter halfway. If your subject is moving, the focus will not lock. Once the focus locks, the green light (the focus indicator) comes on, which means that the focus won't follow your subject. So if your subject moves, you'll need to refocus by releasing the shutter and resetting. Your camera also won't take the picture unless the green light comes on. The difficulty in taking focused pictures with a moving subject is that your subject moves during the time it takes for the focus to lock and the shutter to release. With continuous auto-focus, your camera follows your subject as it moves and focuses continuously. The focus never locks but you'll be able to take the picture regardless. The automatic focus mode tries to meet halfway between the single focus and continuous focus. Your camera attempts to judge when your subject moves and refocuses. Your camera will also not release the shutter until the focus is locked. Likewise, the AF-Area settings can be changed with a switch on the camera with higher end models, whereas in lower-end models, this needs to be changed in the menu options. You only use one focus point with this mode. This gives you the most control over what your camera focuses on. Press the shutter halfway to lock the focus, then shift the camera to recompose the shot. 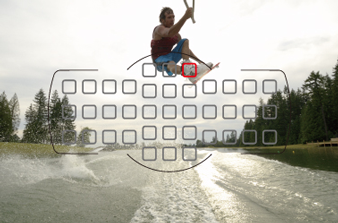 Use the dynamic mode with moving objects and the AF-C or AF-A focus modes. Your camera switches focus sensors when it detects your subject moving. In this mode, some higher-end cameras will also let you set the number of focus points to activate to track movement. In auto area mode, you leave it up to the camera to pick the subject to focus on. Older Nikon models will choose the closest subject, while newer models will try to lock focus on human faces. What combination of AF and area should you use? Obviously only you can decide this in each situation, but using the AF-single servo mode with a single focus point will give you the most control in choosing what to focus on, rather than giving your camera the control. This is also the most difficult to work with if you're taking pictures of anything other than stationary subjects. The key here is to PRACTICE. Practice taking pictures of moving objects with only a single focus point. Develop your skill and you'll be well on your way to taking better photos.